Chinese playing card makers, whether they be based on mainland China, Hong Kong, Taiwan or even Macau, have a reputation for imitation and replication fused with innovation which has produced perhaps the widest variety of joker playing card designs of any single part of the world. Designs copied in whole or part from Western classic designs are chiefly limited to the more prolific, later American, British and Belgian classic designs by the US Playing Card Company, Waddington's, Cartamundi but also encompass designs by Consolidated-Dougherty, Arrco, Hoyle, Brepols, Biermans and Ducale. 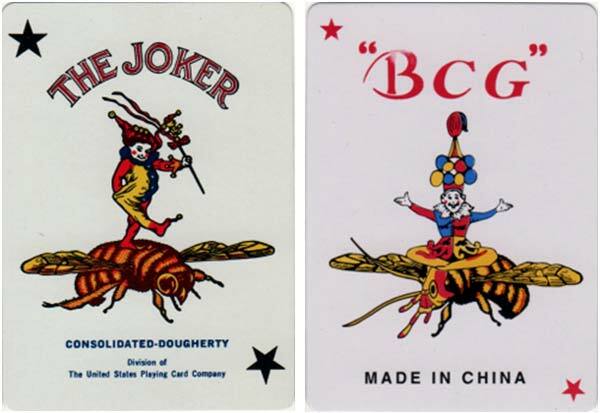 Copies such as this Chinese version of the classic “Bee No 92" poker deck marketed under the brand name BCG are clearly copies rather than fakes. Above: Bee No.92 original joker and Chinese copy. While this anonymous copy of the classic Waddington’s standing jester is a poor quality fake in which no attempt has been made at originality. 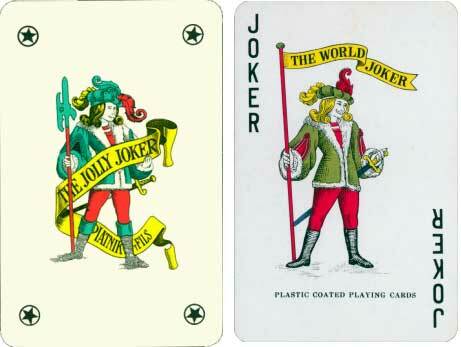 Above: Waddingtons original joker and Chinese copy. 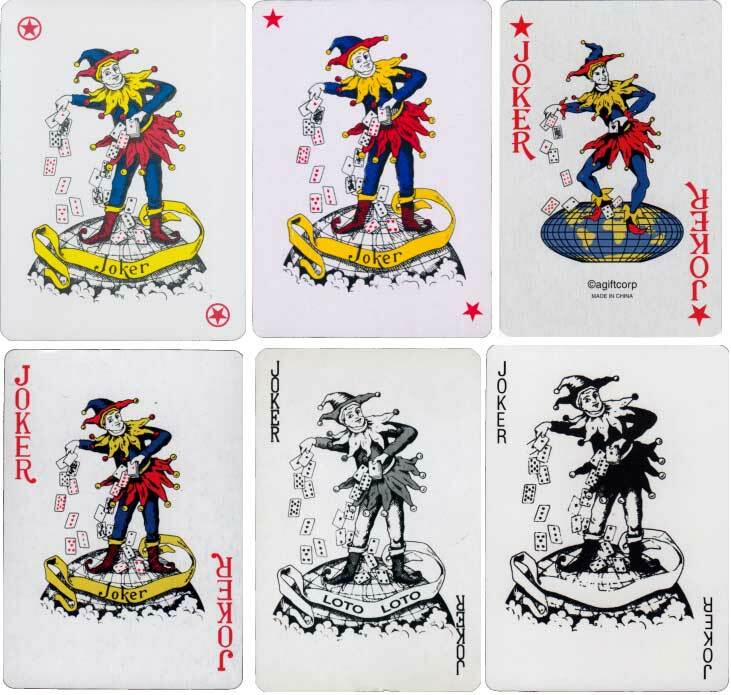 Chinese versions are often easily spotted by the poor quality printing, paper, and the custom of producing one joker card in colour and another in monochrome or even just not coloured black and white, as this Arrco inspired Chinese pair illustrate. 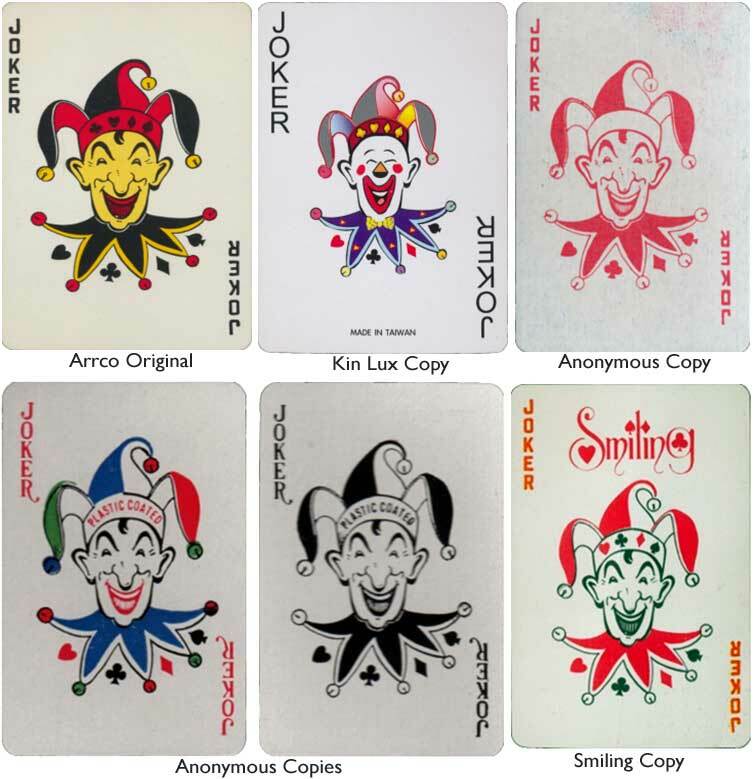 Above: ARRCO original joker and Dragon brand copies in colour and B & W.
The later Arrco laughing head jester inspired a run of Chinese imitations with their own adaptations. 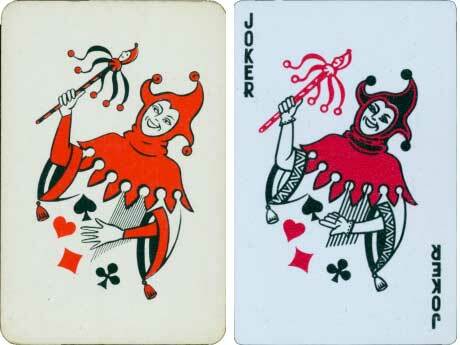 The US playing card company standing jester was copied but incorporating the colouring of the Waddington's standing jester to produce novel variations. 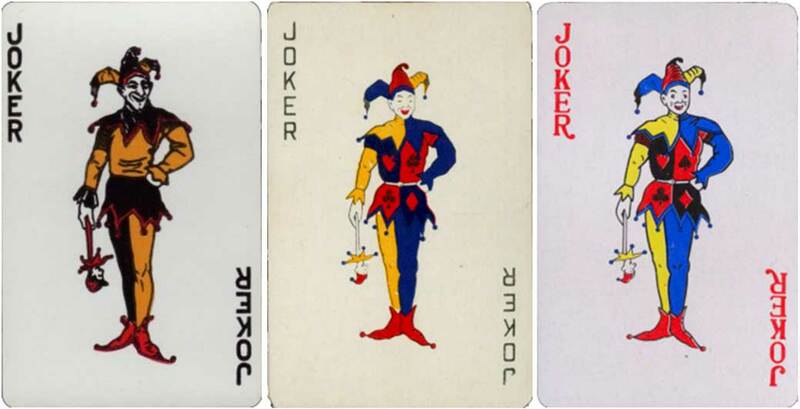 Above: US playing card company standing jester, 'Tiger' brand copy and another anonymous copy. But not as interesting as this design which takes the jester’s face, head, and collar together with the yellow banner from the Cartamundi classic jester, applied to a Chinese original generic unicycling style design. Above: Carta Mundi joker (top left) and various copies. 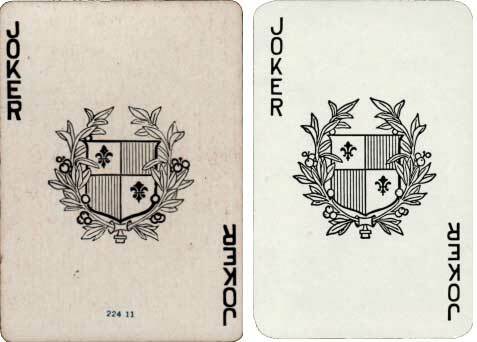 Above: Ducale joker (left) and copy. Above: Hoyle joker (left) and copies. Above: Russell joker (left) and Michaud copy. 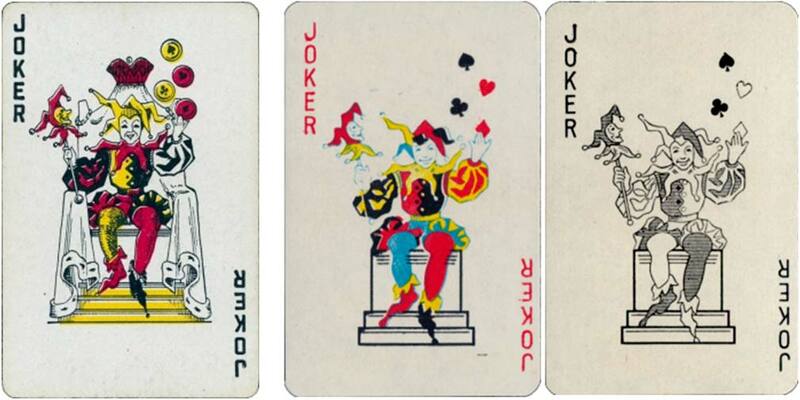 Above: De la Rue joker (left) and anonymous copies. Above: Biermans joker (left) and anonymous copies. 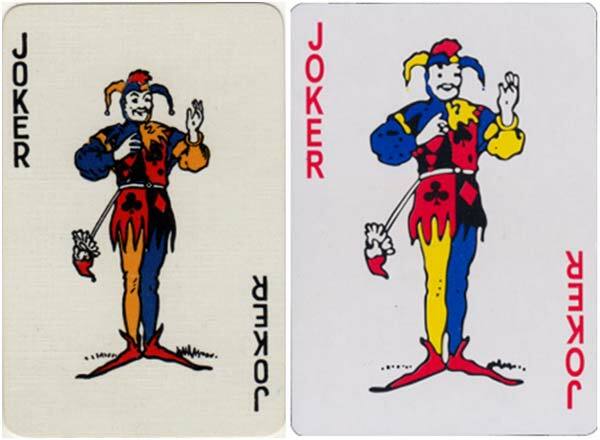 Above: Piatnik joker (left) and anonymous copy.